Thinking outside-the-box while thinking out-of-the-box is something we do well. Great Falls is home to wonderfully unexpected places that can turn a mundane meeting into an unparalleled experience. Elicit spirited discussions, garner rapt attention, and miles of smiles as attendees tackle problem-solving and team-building in settings that inspire and motivate the mind. 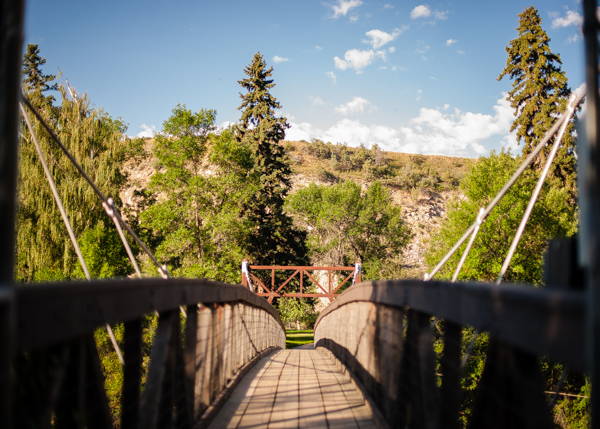 Great Falls is Montana’s Basecamp for Art & Adventure, and those marry well for business, where making memories and making the most out of work are one and the same. Add adventure to the agenda by trading in the day-timer to become a day-tripper, making the next meeting one for the memory book! Give attendees a “wow factor” with a social function or outing at one of Great Falls’ unique venues – with a kickoff BBQ at a stadium overlooking centerfield, holding general session in a historic theatre, or by creating alliances and fostering teamwork when trying to figure the way out of an escape room – the options are plenty. Visit with Dorothy to customize your group’s itinerary to get the most out of Great Falls. The Great Falls historic tours highlight several Great Falls landmarks, including the Lewis and Clark Interpretive Center, Rainbow Falls, the downtown historic district, and Gibson Park. Historic tours are the perfect way for groups to see the city and its attractions, giving inspiration for more exploration. As Montana’s Museum Capital, Great Falls is home to 10 museums, making it easy for cultural enthusiasts and history buffs to explore. The museums include CM Russell Museum, the Children’s Museum of Montana, First Peoples Buffalo Jump State Park, Galerie Trinitas, The History Museum, Lewis & Clark Interpretive Center, Montana Museum of Railroad History, Paris Gibson Square Museum of Art, Malmstrom AFB Museum, and the Ursuline Centre, plus the outlying communities are also hosts to many museums, which can be included in day trip itineraries focused on finding adventure through art. Learn about the incredible life of Montana’s First Peoples, from their early struggles to live on the plains to the strength they portray today at one of Montana’s Indian reservations – home to 12 tribal nations. Holding a central location in the state, Great Falls has many educational field trips within a day’s drive to be worked into an itinerary. Great Falls is hopping – with beer and the breweries that craft them! What better way is there to network, than with the help of one of the oldest and best social lubricants in history – beer! Take a customized tour of some of Montana’s best local craft breweries and enjoy an all-inclusive experience and exclusive behind-the-scenes access to the brewery floor with an informative talk on Great Falls’ brewing history, the crafting process, and best of all – beer tastings! Let conference goers connect, relax, and create a lasting experience. Great Falls is home to D.A. Davidson Company’s corporate headquarters; Malmstrom Air Force Base; Loenbro Pipeline Solution’s corporate headquarters; Great Falls College; University of Providence; MaltEurop North America; Montana Air National Guard; Pasta Montana; McLaughlin Research Institute; ADF Group, Inc; Benefis Healthcare, Sletten Cancer Institute and many others willing to provide scheduled tours to enhance your time in Great Falls. Great Falls is in the heart of the Golden Triangle and is known for growing superior crops, especially wheat. On an agricultural tour, you can visit a flour mill, a grain farm, a cattle ranch, livestock auction, or a variety of agriculture processing plants for an authentic look into the tenacious spirit of Montana’s farming and ranching. Discover why Great Falls is known as The Electric City, a name given to it because of the 5 hydroelectric dams that were built on the series of waterfalls that flow from the Missouri River as a means of power. There are 5 dams located in and around Great Falls, giving groups the opportunity to learn how the dams are used as a low cost and renewable energy source. As the Basecamp for Adventure, Great Falls is a great starting point to meet your group’s high energy expectations. With miles of trails to walk, hike and bike on, easy access points for water recreation like paddle boarding, swimming, canoeing, floating, and kayaking, plus skiing, skating, snowshoeing and snowmobiling in the winter months, adventure in Great Falls’ outdoors awaits! With nearly 60 miles of paved and single-track trails along the Missouri River, the River’s Edge Trail provides the perfect opportunity for walking, hiking, jogging, skating, and biking, along with access points for water recreation. The trails surround spectacular views of the mountain, prairies, river canyons, waterfalls, and reservoirs. Connecting to Great Falls’ historic downtown, parks, restaurants and attractions, the River’s Edge Trail is a great option for group field trips, educational experiences, and fun, networking events. Casting from the bank or boat, you’ll find easy access and blue-ribbon trout for miles along the Missouri River and its tributaries. The Mighty Mo holds one of the highest concentrations of blue-ribbon trout per mile in the United States and is a fisherman’s dream. Great Falls offers a variety of golf courses for players of all experience levels, on public and private courses. Group golf tournaments are a great way to team-build, network, brainstorm, and get exercise and fresh air. Let an experienced golfing staff help plan your group’s tournament, inviting friendly competition and fun in the sun! With four golf courses, Great Falls offers the perfect opportunity to spend a day on the links. Called folf or frisbee golf, disc golf is a growing pastime, and Great Falls is ahead of the curve, with two disc golf courses – an 18-hole course at Warden Park that begins at the gazebo overlooking the city at 4th Street and 13th Avenue South, and a 9-hole course at West Bank Park, which runs along the scenic Missouri River. Both frisbee courses provide an amazing opportunity for meeting attendees to view the city and the surrounding area, compete in a challenging sport while developing team-building skills. Bella Cucina is a beautiful, state-of-the-art performance kitchen inside the specialty kitchen store of Pizazz, located in the historic, downtown district of Great Falls. Through their uber-talented chef and educational director, Pizazz offers classes, workshops, and hosts team building events and private parties in an atmosphere guaranteed to build an appetite for food and fun. Expression through the creation of arts and crafts can lead to increased brain activity. Corporate arts-based learning is an integrative approach and acts as a pathway to explore non-art topics such as leadership and management in business. The goal of arts-based learning is not to teach people to be artists but to create immersive learning experiences using artistic processes to help people gain new insights and perspectives about business challenges. Give your group the chance to gather inspiration from nature during a class in flower arranging. After observing basic design mechanics and floral principles in action, they can immerse themselves in nature’s bounty to create a one-of-a-kind piece for display. Create laughter, fun and a highly unique experience that will be remembered around the office for a long time to come, by giving your group the opportunity to network, practice and analyze their skills in communication, organization, critical thinking, and logic in a high-pressure scenario. Escape the Falls and Zero Escape Rooms have convenient downtown locations and fun staff ready to give your group a challenging outlet for fun. For mind and body wellness, participating in a yoga or Pilates class can be an energizing boost to your group before and after the days’ meetings, or in between breakout sessions. Provide release, relief, and relaxation to rev up for the next important item on the agenda. Groups can scale new heights by using their wits and sheer strength at the Hi-Line Climbing Center. With skilled instructors to guide and give tips, a motivational day spent climbing is a sure-fire way to build momentum and keep the channels of communication open for conference attendees looking for more than just a walk around the park. A day at the ballpark isn’t all fun and games, it can also be a team-building exercise. Centene Stadium is home to the Chicago White Sox affiliated AAA minor league team, The Voyagers, and is a popular spot even when they aren’t on the field. The stadium plays host to parties, concerts, community and company events and provides more than just the standard “beer and hot dog” catering. Groups can go ‘round the field during a rousing game of kickball, enjoy an outdoor picnic, hash over deals and decisions in the Executive Suite, or bolster spirits by cheering on the home team. A day at the ballpark is a day out of the ordinary.